Last month two legal interns and I hired an outfitter to take us dog sledding. After getting into our winter gear, our outfitter drove us through Iqaluit and parked his van by the frozen shore of Frobisher Bay. Walking out onto the ice the outfitter told us about his dogs; how he feeds them a mix of dog food and seal meat and keeps them chained to the ice all winter. These dogs like the cold, he says. 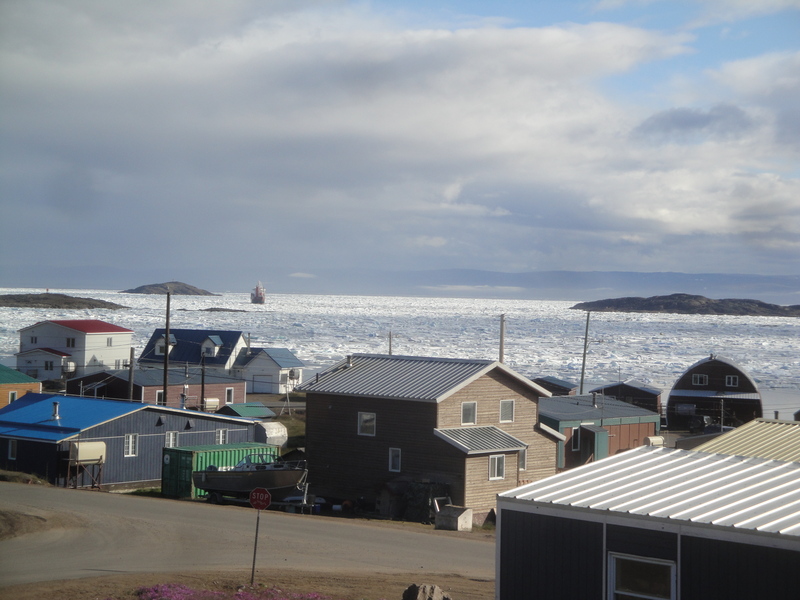 Even Iqaluit, situated in the south of Baffin Island, is a little warm for their liking. In the summertime the dogs move inland and keep to the shade. They don’t run in the summer. It’s too hot and there’s always a risk of overheating. These dogs are made for cold places. As we approach the team the dogs begin to howl and whine. We unhook the dogs from their chains, the outfitter helps the dogs into their harnesses, and then we sit down on the sled behind the team. All of a sudden the dogs begin to pull and our sled, the outfitter, the two other legal interns and I surge forward across the rough sea-ice. 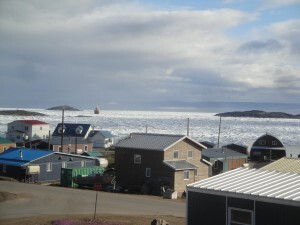 Past Iqaluit. Past the neighbouring community of Apex. Out onto the smooth ice of the bay. The outfitter explains that these are Canadian Inuit Dogs, or Inuit sled dogs, an Arctic working dog that is one of the oldest purebred breeds in Canada. Unlike the dogs in Alaska, these dogs were bred for strength, not speed. These dogs used to pull heavy loads across the snow and ice. Now most of the heavy lifting is done by snowmobiles, four-wheelers and pickup trucks. Still, these dogs are an important part of Nunavut’s history and Inuit culture. The Inuit sled dog experienced a dramatic decline in the 20th century. Some Inuit elders and others in the community have alleged that the RCMP and other government officials killed large numbers of dogs as part of a widespread conspiracy to deprive the Inuit people of their culture. Specifically, some have alleged that the systemic killing of dogs made it impossible for the Inuit to live on the land, thus forcing them into fixed settlements and a culture of dependence (Final Report: RCMP Review of Allegations Concerning Inuit Sled Dogs at p. 5). In response to these allegations the RCMP conducted an inquiry and in 2006 published its Final Report: RCMP Review of Allegations Concerning Inuit Sled Dogs. The Report attributed the dramatic decline in dogs to the introduction of snowmobiles in the 1960’s, canine disease and the destruction of some dogs by the RCMP in the 1950‘s-1960‘s for health and safety reasons. The Report found no conspiracy to destroy the dogs or the Inuit way of life. There are clearly two different versions of events (as documented in the 2010 NFB film Qimmit: A Clash of Two Truths). Or, more specifically, two versions of how and why certain events happened. Both parties agree that the RCMP killed dogs. Where the parties differ is in regards to how many dogs were killed and why the RCMP killed them. As a legal intern at Maliiganik Tukisiiniakvik Legal Services I often encounter conflicting narratives, and I’m learning that piecing together what happened and why it happened is an important part of my work. Many mornings begin with a notice from the Crown’s office that an accused is being held at the RCMP detachment awaiting a “show cause” or judicial interim release hearing that afternoon. Our office receives disclosure in the form of the Prosecutor’s Information Sheet (PIS) that includes witness statements and RCMP allegations of what happened. I’ll review the PIS with the supervising lawyer and we’ll arrive at a preliminary understanding of what allegedly happened. However, when I meet the accused at the RCMP detachment to discuss their upcoming show cause hearing, I am sometimes confronted with another version of events. Certain allegations are denied. More often I am told why certain events did or did not happen. Sometimes issues of self-defence or provocation are raised. Other times the accused himself has been the victim of violence in the past. This information will be critical in understanding the case and crafting an effective defence (should the matter ever go to trial). Context is also important at the sentencing stage of the process, particularly in light of the sentencing principles articulated in Gladue and Ipeelee and s.718.2(e) of the Criminal Code. And while my work as a student never involves the actual trial or sentencing stages of the process, these principles and considerations are still relevant in the context of show cause hearings. As one lawyer explained to me, if it’s unlikely that the accused would face jail time even in the event that they were convicted, a strong argument can be made that the accused should not be detained prior to their trial. The accused and I also discuss aspects of their life. Are they working? Are they supporting children? Where and with whom are they living? Are they hunters? What is their history? These are important elements of the story that are rarely found in the PIS. This context also has an impact on the outcome of the bail hearing, the coherence of the release plan we will propose, and ultimately whether or not the accused will be released pending their trial. Several defence lawyers have told me that listening is an important skill to develop. One lawyer told me that listening and telling her client’s story in court is one of the most important things that she does. Maliiganik’s clients’ voices are often unheard. The RCMP Review of Allegations Concerning Inuit Sled Dogs also underlines the importance of listening, hearing and reflecting people’s history and lived experience. More telling than the conflicting narratives was the Report’s methodology that relied heavily upon RCMP officers’ accounts of events, as well as official RCMP and government records. The Report noted that the review team was unable to review many Inuit elder statements that were held by the Makivik Corporation and the Qikiqtani Inuit Association. Instead, the team reviewed elder statements in the fifty-four minute “Echo of the Last Howl” documentary. This section of the Report suggests that RCMP officials were unable to coordinate their efforts and investigation with Inuit groups. The Report might also reveal an underlying distrust that sometimes exists between certain members of the community and the RCMP (or perhaps the law more generally). When working with Maliiganik clients and their families I sometimes have to make it clear that I am working for the accused (and in their interest) and not for the Crown. This is especially true when I am calling remote communities to represent a person with whom I’ve never met. How do you engender trust over the phone? How do you let the accused know that you’re listening and that you have their best interests in mind? How do you even know what is in the accused’s best interest when you have never met them in person and you have a cursory understanding of their personal history and the events that brought them into custody? The RCMP Report suggests that officers were acting in the best interests of communities when they destroyed Inuit sled dogs in the 1950’s and 1960’s. These dogs were loose, sick or starving and they posed a health and safety risk to the community. That is why the RCMP destroyed dogs according to the Report. But that is not necessarily how the RCMP’s actions were perceived by members of the community at the time, and it is not how this history is remembered now. In order to act in a person’s best interest, their history and perspective must be understood and acted upon in some way. I am continually learning and re-learning this lesson at Maliiganik Tukisiiniakvik Legal Services. 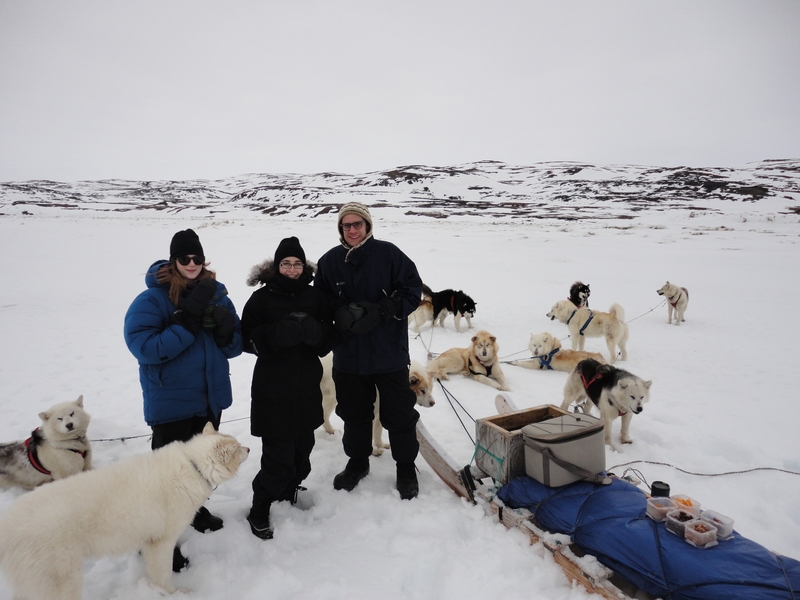 Back on the ice with the dogs, our guide and the other two legal interns. We decide to stop and rest the dogs. Our guide produces a large Tupperware container of cubed cheese, cured meats, chocolate covered goodies and hot chocolate. As we sip our hot chocolate and admire the light on the land and the snow-covered bay two hunters zip by on their skidoos. They wave and disappear over a snowy ridge. It’s a good time for seal hunting, our outfitter explains. I ask him to take our picture. One of the dogs, sensing an opportunity and the momentary lapse in his master’s attention, lunges for a piece of cured meat and wolfs it down. Published by davidnugent on July 5, 2013 at 9:48 am under In the field. 0 comments.